Two young lovers with nothin' better to do...Bobbie Sue took the money and run. Go on take the money and run." Steve Miller Band "Take the Money and Run"
One hot Monday afternoon in August 2005, my friend Shayne ran into an old school friend who mentioned that the Steve Miller Band was playing that Thursday about three hours away, and both of us being Steve Miller fans, wanted to go. So I called the venue and yes, they still had tickets and the show started at 8pm. I run my own business which is open until 6pm so I had a slight problem. The concert was three hours away which meant I had to be on the road no later than 5pm. I don't have any employees but every now and then my daughter will hold down the fort while I take off, but no luck there as she had to work her regular job. I called around and asked other friends and family but still no luck. So I sort of resigned myself to no Steve Miller concert. Thursday evening about 4:58pm Shayne says it sure would be fun to go to the Steve Miller Band concert and if we left right then we could probably make it on time. Being the conscientious businesswoman I am, I never close early but I stopped for a moment and thought about it. What would matter most in ten years? If I had closed one hour early or had a fun time? So I decided right then, to go. I looked at Shayne and said, "Let's take the money and go." At that very instant the radio began playing Steve Miller Band's "Take the money and run.". Shayne said "Do you hear that? ", I said, "It's a sign". So we put a note on the door, took the money, and hopped in the car. So we are driving down the road and realized we have no tickets. So I call the box office and all they have are lawn tickets. So I said "thanks" and hung up. When I go to a concert I want to be up close! Shayne asked if they were sold out and I said "No, but they only had lawn". He said I should have bought them but I said "Maybe there will be someone out front selling front row seats.". Shayne said, "There's not going to be anyone selling front row tickets, but I once knew a guy who got a third row ticket out front.". So I said, "I'll take third row!". We pull into a parking space at the venue at exactly 8pm. As we are walking up the path toward the box office a man steps onto the path and asks "Do you need tickets?". I ask, "What do you have?" He said, and I kid you not, "Third row center". Shayne's jaw hit the ground, I laughed and asked how much. The tickets were cover price, no fees. I bought them. All the way to the gate Shayne kept asking me if I thought they were real.. Of course I did. At the gate, they scanned our tickets and usher us to the pit! They were third row pit seats! 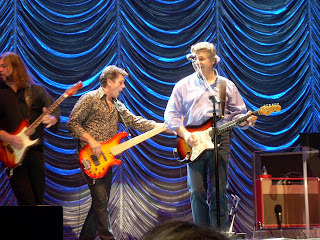 Steve Miller would practically be sweating on us! Shayne and I both agreed how lucky we were with these fantastic seats. Then I said all I needed now was a guitar pick from the band. Well, the Steve Miller Band started playing about 8:30, it was a beautiful summer night, and there was a full moon too. The concert was fantastic! The band members threw out their picks but I didn't get one. They came back for an encore, threw out more picks, still none, then Shayne turned to me and said "Well, I guess you didn't get your pick" and just then a pick literally hit him on the side of the head and fell into his lap. He said "What's this? "...I said, "My pick!". So now my motto is "Take the money and run". Here's a photo of my ticket, pick, and the note that we put on the door that day. 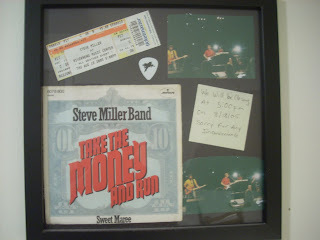 This year on the sixth anniversary of this event, the guy who had told Shayne about the concert came by about 4:58 pm, and I was telling him that this was the moment I decided to go and at just that moment the radio began playing as if on cue, "Take The Money and Run" by the Steve Miller Band. It gave me chills. "See a Penny pick it up all day long you'll have good luck"
When you see a penny on the ground do you pick it up? I must confess, I am a runner. That's right, I love to run. Running is like my morning meditation. I get lots of ideas and feel totally energized after running. Whenever I am running, or walking for that matter, if I see a penny I always pick it up and think "today's a lucky day". One morning in August a few years ago...while out running I look down and see a penny so I stop to pick it up. 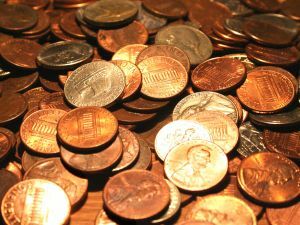 I look over and there is another penny, and another, and another, so I pick up a handful of pennies thinking "wow, this is a lucky day" and I take off running again. Before I get too far, I look down and there is another penny. I pick it up, take off running, and once again I look down and you guessed it, another penny. By this time my pockets are starting to really jingle as I run so I look around for something to put all these pennies in. I find an empty taco bell bag, put my handful of pennies in it, stash it behind a bush and take off running. Again, I'm running a couple minutes, look down and there is another penny. I know this sounds crazy! I run three miles and the whole time I am stopping to pick up pennies. When I finish my three miles, I go back to where I stashed the taco bell bag, put all the pennies in it and try to carry it while running back to my apartment. When I got home I showed the bulging bag of pennies to my daughter and said look what I found! I found 534 pennies, a few nickels, dimes, and a quarter for a total of $6.04. Wow! What a lucky day! I am a Lucky Lady blogger! My name is Kathleen and I am a lucky lady. I believe 100% that we have the power to improve our luck and our lives. 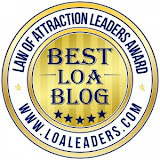 My blog is meant to inspire, uplift, and help you improve your luck and improve your life. I will share along the way "lucky" experiences from my lucky life! I believe Life is meant to be fun! How many times do you wish and want for something but don't really expect to get it? If you are like most people the answer is every day. Today is your lucky day! I am going to share one of my lucky secrets with you. Are you ready? ASK, then PREPARE TO RECEIVE. I have a client (his name is Rob), who had to move in a hurry last year because his apartment building was sold and he was given thirty days notice. Not much time to find an apartment and in his case even harder since Rob is in a wheelchair and doesn't drive. So Rob took an apartment across the street but wasn't happy with it. So all year he has complained about his small apartment, looking out his window at a brick wall, etc. He began looking at other apartments and started saving money toward moving each month. He even took a class on buying and owning your own home just in case he found one he could buy. He was feeling a little discouraged because it's been almost a year. Three weeks ago Rob rolls in and tells me he will be a little late coming by the next morning because he's going to look at yet another apartment. The next day he shows up totally excited. He had found an apartment he really loved, had all the room he wanted, in a great location. He said that even though rent was a bit higher than before he could swing it and he asked the landlord if he could rent it. The landlord said he would consider his application and let him know in a few weeks. Then Rob said, "I want this apartment! I am going home to pack! Do you have any empty boxes?" and I gave him all my empty boxes. It's now three weeks later and guess what? He's already moved in and enjoying his new place. So what have you been wanting? Today can be your lucky day! I just won $70.00! Woohoo! Lucky Lady Wins Again! After watching a few episodes of "The Lottery Changed My Life" and seeing people who have won big with lottery scratch off tickets I realized that the saying "you can't win if you don't play" is true. So I decided I would play $20 a week in lottery scratch off tickets. Now I'm not suggesting or encouraging anyone to run out and buy lottery tickets. Everyone has to make their own choices. I am just relating my experience. After all, I am Lucky Lady. I did some research on the games such as prize amounts, payoff percentages, etc. and chose the games I would invest in. Each week I go buy my tickets and any money I win above the original $20 investment, I put in the bank. So far, I've been lucky! It's been about three months and I am still ahead. In other words, I have won back all the money I have spent plus some extra. It's not a lot, but every time I buy my tickets I have the chance to win the BIG prizes as well and that's why I'm playing. I want to win the BIG prize! One thing I really like about the scratch off tickets is that somewhere, someone, is going to win the prize because the tickets are out there waiting to be purchased and it will only be me if I buy the tickets and take the chance. I love it when I win money!